Confirmation is a traditional education ministry common in many churches. The goal is to “form faith” more fully in emerging adolescents. “Teaching the faith to Junior High kids? Yeah, right!” Here at Resurrection, we not only embrace this challenge, we have fun with it! RLC uses the “Head to Heart” model of ministry pioneered by Faith Inkubators. The youth are gathered in same-gender small groups of 4 to 6 youth with one or two adult faith mentors. A typical month will have them meeting with all of the other groups for a Learn event in which our Lead Pastor serves as the primary teacher. After the “teaching time”, the small groups meet to provide a context for the lesson. In addition to the two learn events, a third event takes place each month, alternating between a Serve and a Play opportunity. Sometimes these take place with the full group participating together and on occasion just the small group. For all three “legs” of the FaithBuilders ministry (learning, fellowship, service), building relationships is the faith engine – building relationships with God, with others, and with one’s own soul. To teens and almost-teens, friends are of the utmost importance. RLC’s FaithBuilders Ministry, with the Head to the Heart model, harnesses the power of these friendships with small groups building a network of care at church that extends into the home as the context for learning. Through learning, serving, and playing together, small groups bond together as living cells in the body of Christ. Simple but effective nightly family devotions solidify the learning experience – tying what is taught at church with what is talked about at home. Our middle school youth meet two Sunday evenings a month from 5:30-7:35 p.m. Contact Pastor Ryan Bailey at prryan@rlcindy.org for questions or inquiries about volunteering. Each winter the FaithBuilders and Youth Group gather for a weekend of spiritual renewal, fellowship, and fun activities. Past weekend trips have included staying at Pretty Lake Camp and skiing near Kalamazoo, Michigan; staying at Camp Allendale and zip-lining near Trafalgar, Indiana. Our goal is for our youth to develop relationships with peers and faith mentors in a relaxed setting. Either weekend includes a movie with discussion, a youth-planned and led worship service, time for playing games, biblical discussion, and interacting with the faith mentors on the trip. Do you like playing fun games with others? Do you enjoy singing camp songs? Are you willing to be a friend to younger children? Are you capable of making some crafts? Do you have a desire to serve God? If you said “yes” to these questions, we need YOU! We’ve got a fun way for you to grow in your faith and discipleship skills this summer by serving as a junior faith mentor for VBS. Join the VBS Team for an awesome week at Resurrection from 9:00 a.m. to 12:00 noon, Monday through Friday. Youth who register as VBS junior faith mentor must attend the VBS equipping event that takes place the week before VBS. 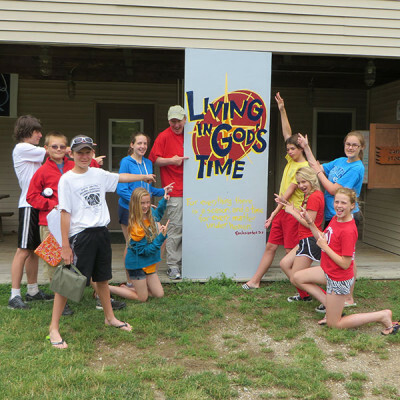 Past Confirmation Camp participants have acknowledged that camp is one of their best memories. Camp offers a unique opportunity to deepen faith and friendships within the church, and we strongly encourage the camp experience at least once during the three years of Confirmation preparation.